You could win a new Home from Wheel of Fortune! America’s Game is giving away the American dream… For the first time ever, we’re giving away a brand-new home! You could win your own piece of paradise in a Latitude Margaritaville 55-or-better community by Minto. Choose Hilton Head or Daytona Beach, and get ready to relax, enjoy and live the Margaritaville lifestyle every day. Prizes/Odds of Winning. 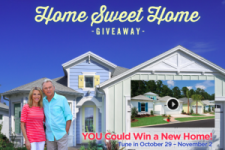 One (1) Grand Prize: The Grand Prize winner will receive one (1) home located in a Latitude Margaritaville Community in either Daytona Beach, FL or Hilton Head, SC. Grand Prize will consist of a two (2) bedroom, den, two and a half (2.5) bathroom, approximately 2,080 A/C square feet and 2,930 total square feet house. Actual selection of the location of the home is to be made by the Grand Prize winner, choosing between Daytona Beach, FL or Hilton Head, SC, and is subject to Sponsor’s approval in its sole discretion. Approximate Retail Value (“ARV”) of Grand Prize: $350,000 U.S. Actual value of the Grand Prize depends on market fluctuations. Grand Prize winner must be aged fifty-five (55) or older in order to qualify to live in either the Daytona Beach, FL or Hilton Head, SC Latitude Margaritaville Community. In the event that the Grand Prize winner does not qualify to accept the prize (or if he/she prefers not to accept the prize) such Grand Prize winner has the option to instead accept a townhome located in the Festival community in Davenport, FL. (ARV: $350,000 U.S.) or receive $150,000 U.S. (awarded in the form of a check).